Today is the 4th day of my self-created challenge to myself to create a holiday cheer card every day for 31 days and it is also the Verve's December Diva Inspirations Hop. It's the 5th of the month and that means it's time for the Divas to serve up some fresh inspiration with their Verve stamps! Leave some comment love along the hop spots for a chance to win a prize, then grab some stamps and play along with our December inspiration challenge for another chance to win! Ribbons and sparkle and merry galore! Create a card inspired by the decorations of the season! Need a little inspiration? 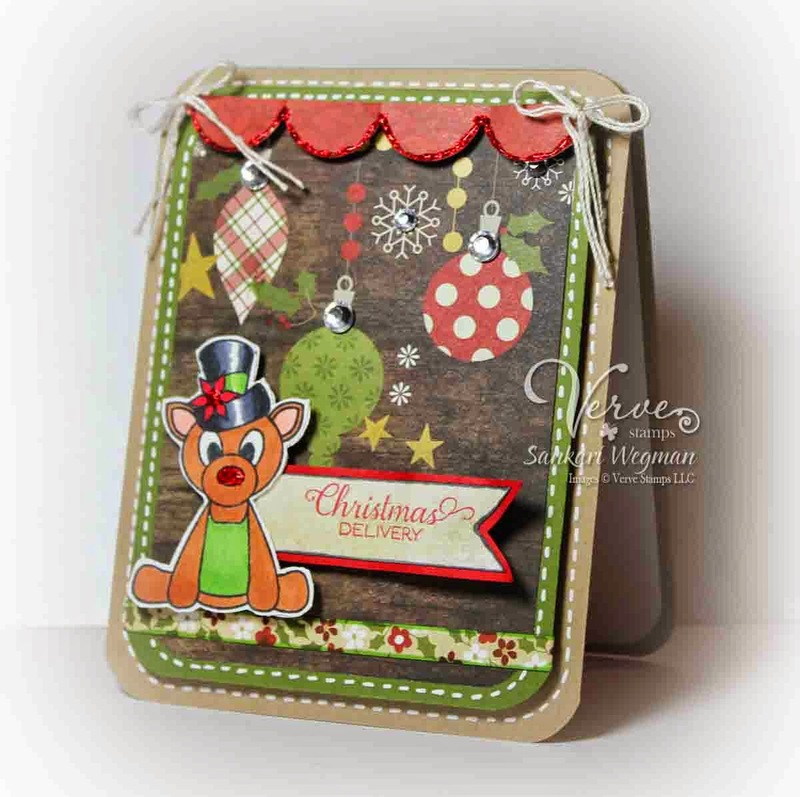 I created a quick and fun card using Santa's Helper from Verve Stamps. Isn't this guy adorable - I have a soft spot for him, he is just so cuddly! I cut, colored and popped him over some DP with Christmas decorations and then added some scalloped edging with some twine bows on the end And don't forget the little bits of glitter to the nose and poinsettia on his hat! Check out the blogs linked below to see what the other Divas did with the challenge! It's sure to be a treat, and speaking of treats, we've got a prize for one lucky commenter along the hop! Check out the Verve Blog today for all the prize info and deadlines! Thanks so much for hopping over today! Please hop over tomorrow for some more holiday cheer! This is so fun and so cute! He definitely put a smile on my face! Love all the added detail like the faux stitching, the twine in the corners, and all the sparkles! Fun card! Love all the touches of white. Super cute card - love the reindeer. WOW amazing and super fun card!!! Wow! This is a whole bunch of layers of Christmas goodness wrapped up in one card! Very sweet and sparkly card! Sweet card. The DP is perfect here and I love how you added the sequins to the ornaments. Love all of the embellishments. The little animal is darling. He make you happy to see his smiling face. This is so adorable, Sankari! So cute love all of the details and patterned paper! What a little cutie. Thanks for sharing sweet card. Really love this! Such a cute and happy card. Great fun card. He definitely is adorable. This is adorable!! I love the papers you used! Darling card! The papers really make it pop. OH, how cute!! I love all the patterns you used. And that little reindeer IS super cute. So cute. I love the red accents. What a fun and cute card!!! I knew this was going to be colourful and you didn't disappoint. Great card and good luck with your challenge. So cute! Love that little deer and great paper choices! Cute! Love the colours you used from the picture. Wow! That's one creative card! Great use of the DP.